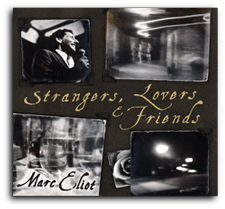 marc eliot: "Strangers, Lovers & Friends"
This very special collection of songs includes both cherished American Songbook standards and original compositions inspired by my love of that genre. The original tunes are my personal portals to people and places I encountered, embraced and adored. My wish is that these songs will become woven into the fabric of your listening life and offer you both pleasure and sanctuary in the playlist of your days. From "Strangers, Lovers & Friends".